Ready for a magical night of dancing at the hottest nightclub in Put-in-Bay? The Green Room at Mr. Ed’s makes sure every night to one to remember. With gorgeous views of Lake Erie, DeRivera Park and downtown Put-in-Bay harbor, this is the spot to be when the sun sets on the lake. The best DJ’s in the region regularly spin at The Green Room. The high energy vibe pulsates through the dance floor as everyone gets down and gets dancing. A full bar keeps you refreshed all night long. This bar can be accessed from every single side so the bartenders can sling drinks at amazing speeds so you can get back to dancing. When you need a break, head to one of the many comfy lounge areas surrounding the bar. Plush couches and chairs provide a much needed respite and a place for intimate conversations. Conveniently located in the middle of downtown Put-in-Bay and minutes from the Jet Express dock. 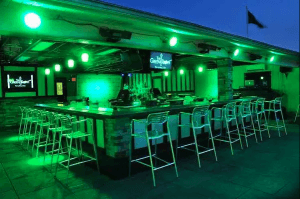 Located on the rooftop of Mr. Ed’s Bar and Grille, this spot is located right in the middle of the action. Enjoy a delicious dinner before you night of dancing. Mr. Ed’s services up some of the most delectable dishes in town. From gourmet burgers to mac and cheese and their famous chicken chunks, Mr. Ed’s whets every appetite. The Green Room is also available for private events. Work with their friendly staff to book your next big party or business meeting. Work with an Event Specialist to plan your perfect event. From menus to drink options and decor, they have everything covered.